Thumbs up to Adam Warren for representing the western manga artist for so long. 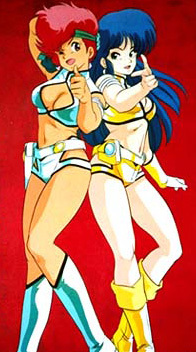 Another thumbs up for helping to increase the popularity of the Dirty Pair in the west and for not allowing the characters to fall away... never ever to be remembered. I remembered when I first read Sim Hell, it took me ages to finish it (back in the days when reading something so long seemed daunting to me). 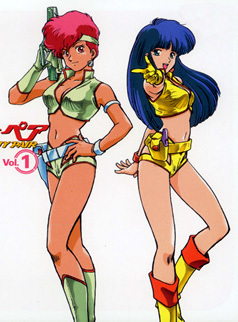 Anyway, what we have here with Kei (the redhead) and Yuri (usually with Black or blue hair) is a destructive duo who are supposed to be known as the Lovely Angels, but because they always leave a path of destruction they are refered to others as te Dirty Pair. The stories usually involve a mad scientist, or a cyber criminal and the environments usually resemble those seen in those seen in the film Blade Runner. On a final note, who cares if women in manga comics have lips or not... a lot of people have been giving Adam Warren a lot of stick for drawing women with lips. Well, at least he draws his own way and isn't just a copy-cat of someone else's style.